Posted on December 24, 2014 by Financial Underdog	in In Soviet Russia!. As you know, the main theme of this blog is personal finance and relating with money. But sometimes I get questions sent to me about something completely different. For example, the other day somebody emailed me and asked if people celebrated Christmas in Soviet Russia. While I’m not an expert on Soviet Union, I was born in Soviet Union and lived in Soviet Union till my teenage years until the country fell apart and became Russian Federation (or Russia for short). Few years later, our family decided to move to Canada where I lived ever since then. But I still remember my Soviet Union childhood rather vividly, and sometimes it’s fun to sit around and talk about how things used to be. So, why not? 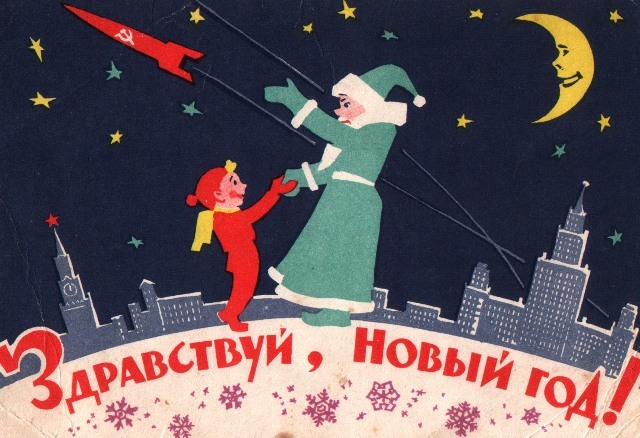 Did people celebrate Christmas in Soviet Union? Not quite. As you may or may not know, Soviet Russia wasn’t a religious country. While nobody would send you to jail for believing in God, it was regarded as something outdated and silly. Churches had their fair share of parishioners, mainly senior citizens. But younger people for the most part were non-believers. For example, I grew up in a atheistic family. Neither my mom nor my dad ever mentioned God to us outside of saying “Oh dear god, what have he done this time?” while talking to my school teacher. Instead, celebrating New Year on December 31st was promoted. By far it was everyone’s favorite holiday. New Years holidays usually meant time off school and time off work. New Year celebration also meant eating a lot of food and spending time with your family and friends. New Year is all about saying goodbye to the past year and the welcoming of a new one. It’s focused on celebrating happiness, love, prosperity, relationships. Was there Santa in Soviet Russia? Because celebrating Christmas in Russia was changed to New Year’s celebrations, Santa was also transformed into Grandfather Frost (or “Ded Moroz” in Russian). His roots lie deep in Slavic culture and Russian fairy tales. He became #1 symbol for New Year’s celebrations, just like Santa is to Christmas. Soviet Grandfather Frost is dressed a little different and looks much taller than Santa. Nonetheless, he still brings presents to kids. He would show up just before the New Year and place gifts under the tree. Grandfather Frost often seen with a sidekick of sorts – his granddaughter Snow Maiden (or “Snegurochka” in Russian). She helps her grandfather with delivering presents and directions. Admit it, she looks way better than Santa’s elves, right? Oh sweet, there were presents? Of course there were presents! Who doesn’t like presents? But unlike Santa who just gives away presents, Grandfather Frost would sometimes make you work for it. For example, during New Year’s celebrations in kindergartens, Grandfather Frost would often show up to party with kids. Instead of just giving you presents, he’d inquire you about your grades, ask you to recite a poem or sing a song, and sometimes do a little dance just for him. If he was satisfied, Grandfather Frost would pull out a gift for you out of the bag. After that, he’d bust a move with Snow Maiden dancing around the decorated New Year’s tree together with kids. Good times, good times. So, there was a tree too? Absolutely. There’s no New Years celebration without a decorated fir tree. As a family tradition, we would put up our New Year’s tree and decorate it together. Presents were placed under the tree to be found and opened by kids the morning after. The only minor difference is that most Soviet New Year trees were topped with a Red Star as opposed to angels on Christmas trees in Western World. Political message of sorts. Major cities also put up giant New Year’s tree for people to enjoy outside. – Watching Russian president’s short message on TV just before midnight in which he thanks everybody for support and promises nothing but a good time in the year to come. – Calling all your friends and family around the country to congratulate them and totally overloading the phone lines.